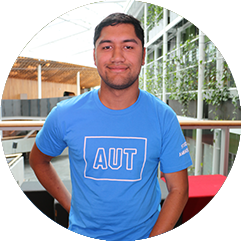 Coming along to Orientation will help prepare you for your first few days at AUT – you'll get tips and advice on what to bring to classes, where you can buy textbooks and food, and how to use your time between lectures. Wear whatever makes you comfortable during Orientation and once your classes start. Our Student Ambassadors say jeans and a t-shirt are a typical first-day outfit. Comfortable shoes are a good idea – there can be lots of walking between classes. Bring something to take lecture notes with (pen and paper, computer or tablet). If you don’t have a laptop you can hire one from Tech Central. Bring food with you, especially if you have a long day or you need to save money. For the first few weeks of semester our student ambassadors are on campus to help you find your way and answer questions. Look for the blue AUT t-shirts. Check out our information on campus tours, maps, directions, accessibility and how to get around on campus.